January 2018’s Toronto housing market is reflecting the measures taken by various levels of government to cool escalating home prices and consumer debt. At this time last year, we were in the midst of a housing price spike driven by exceptionally low inventory, which should be recognized when making comparisons to January 2017. 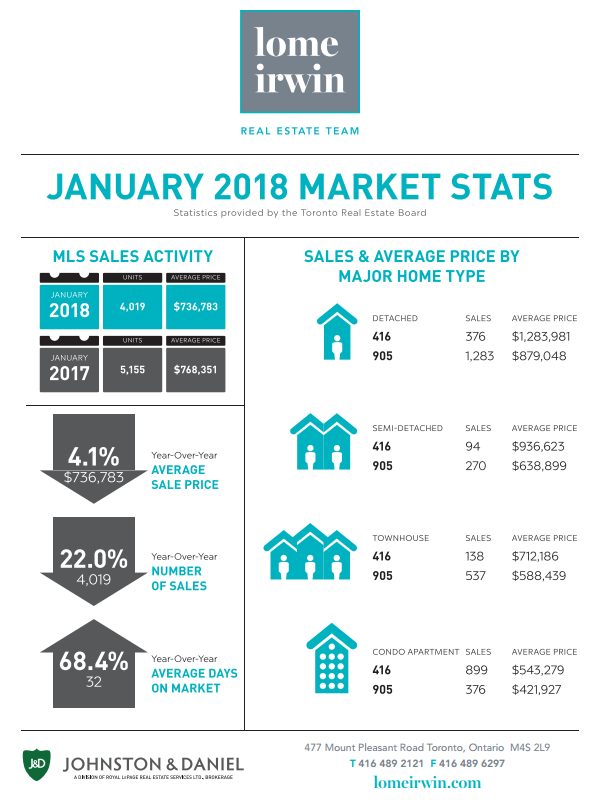 However, prices for January 2018 show a more modest growth consistent with the last half of 2017, and coupled with an increase in inventory, may be a hopeful sign for buyers who have been shut out of the market for lack of product. The Ipsos research quoted in TREB’s 2018 Market Year In Review & Outlook Report indicates that 74% of likely buyers in the GTA think they will still qualify for a mortgage at the 2 percentage points higher than the posted five year fixed rate, as required under the new OSFI stress test rules. Take a look at the highlights from TREB’s Market Watch for January 2018.